The support. At every class since I’ve announced my pregnancy, at least one fellow mom has asked me how I’m feeling. During the first trimester, my answer was normally some variant of “eh.” During the second, the answer was generally peppier. Now we’re into the “large and anxious” territory. Through each phase, my tribe has been there for me (with reassuring words that yes indeed, I will survive being a Mom of two). It’s either go to class, or chase a toddler around the house all morning. In a blog about my FIT4MOM anniversary last year, I talked about how my life would be different without this group. My feelings now are pretty similar. I work part time at SVM Solutions on Tuesdays and Thursdays, so my daughter is in daycare on those days. On the other days, I’m a stay at home Mom—and I honestly don’t know how I would have survived MWF pregnant without Stroller Strides. It’s my routine and my sanity. Many strong mamas have gone before me (and are with me). Margie was in class on a Friday before she delivered on a Monday. Emily was the same way—her son was late, and she was in class past her due date (we used to wait for her arrival to class as an indicator of whether or not she’d gone into labor). Right now, there’s a bit of a “Baby Boom” going on at FIT4MOM, and we’re all trucking along together. It makes me feel good. Even when my afternoons are less than productive, at least I know I’ve worked out a few times a week and have given my daughter some quality time to play with her friends. 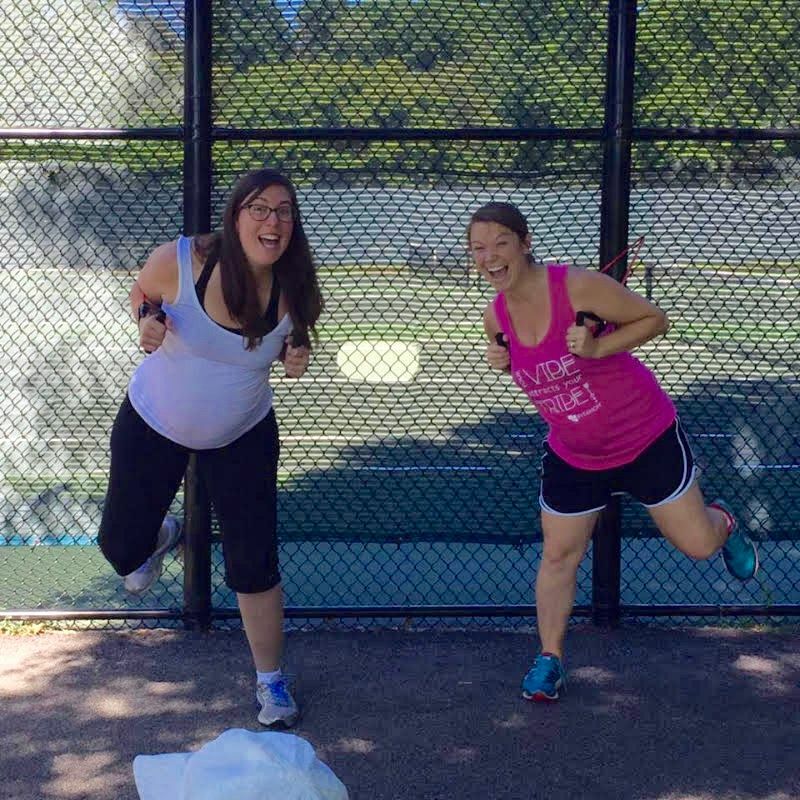 Endorphins are real, and they’re great for pregnant mamas, too. Plus, the instructors are awesome about giving me modifications for more intense exercises and encouraging me to listen to my body. It keeps me in shape for birth and beyond. I’ve got a baby to deliver and at least a couple of sleepless months ahead of me. Where else am I going to get the energy to do that with a toddler? If things go smoothly, I’ll be in class again (and hopefully going to Stroller Barre during leave, too) once I get my doctor’s clearance. Bring it on! Thanks to all of my FIT4MOM mamas that have helped carry me through this pregnancy. I can’t wait for you to meet this little one and share Our Village with her too! And remember, if you’re pregnant, FIT4BABY is another great pre-natal workout option that you can enjoy without kids in tow.